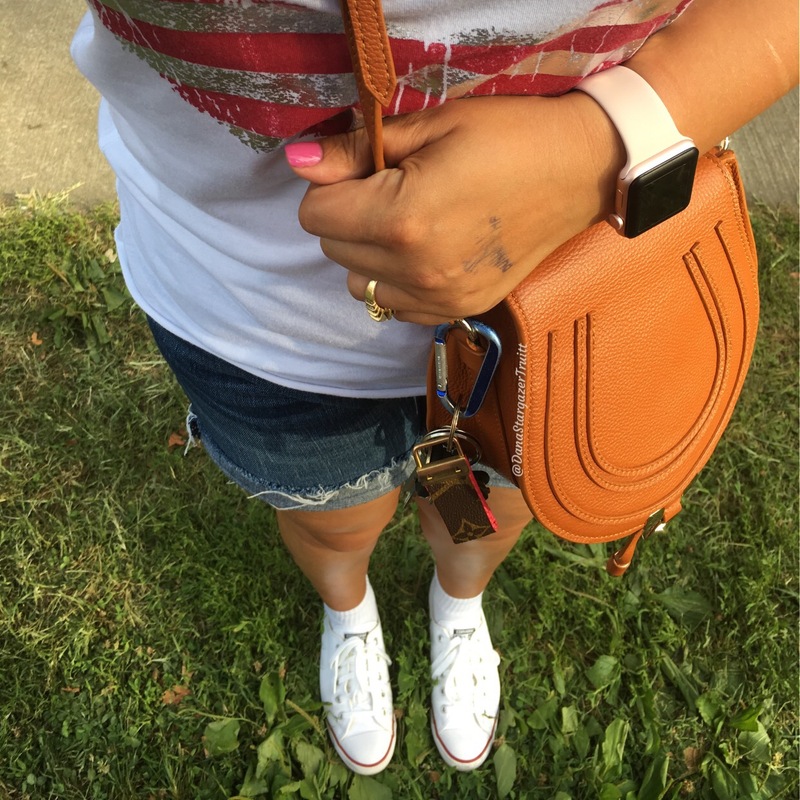 Our Fab Fash Life: Fourth of July Fun at the Dundalk Heritage Fair!! I hope everyone had a safe and Happy 4th Of July Holiday! I wanted to write this post and get it up before July 4th, but then I wouldn't have been able to get all the details in, so I decided to finish it up today. We started off the holiday weekend by going to the Dundalk Heritage Fair, it ran the 30th through the 2nd. It's an event we attend every year for the past 5 years n a row. All weekend they have live bands and music, rides, yummy food, and lots of fun activities. The first night we saw a long time favorite of ours, it's a Baltimore band called Kix. They have the all to popular hits like "Close your Eyes", and "I Got the Itch!" We go to see them when they make an appearance in MD, because their a great and super down to earth band. Nothing is more annoying then a snobby group...lol! We arrived early to scout out a spot by the stage, and post up our folding chairs. It's the best way to get a good spot, and hold onto it without actually being there. That way we can leave and walk around, get something to eat, and people watch while we wait for them to come on at 8pm. The only real annoyance of the evening was that it was 95 degrees, and I'm the worse when it comes to really hot weather. I got myself a big grape snowball, with marshmellow piled high on top to cool myself down. I also scored myself some oh so yummy cotton candy. We walked around for an hour or two waiting for the band to come on, and there were so many different stands. Craft stands, food stands, all kinds of t-shirt stands, and there was a face painting spot also. The line was really long, there were so many little ones waiting to get their faces all done up. Then there was the beer garden, it was packed full of people. Now me personally I don't like draft beer, especially in a plastic cup on a super hot day. Within ten minutes it gets luke warn, and tastes so so nasty, I just decided to skip having a drink. I did have a yummy daiquiri later that evening which turned out to be pretty good, it's a shame I didn't know they were there sooner. After schmying around for a couple hours, and looking at all of the interesting items for sale, we decided to get something to eat, and play a few games. Half of the festival is a full on carnival, and the other half is a crafts fair meets music festival. This is why we love it so much!! I always love the pretty carnival view of the ferris wheel, and the cotton candy flags waving in the wind. I was really bummed that I couldn't bring Noon along, but I was afraid that the loud music would bother her, and I also feared that an intoxicated person may step on her or something stupid, and I would have got into some heated altercation. So to avoid all of that, I just left my baby home. I know she would have loved the little petting zoo, and the racing pigs. YES...racing pigs!! They had this little event set up where the cutest little oinkers ran around a little race track. I thought it was super weird, but others didn't, there were so many people crowded around waiting to see them go. Now I have to admit they were adorable, and there was also a little tent where kids could ride miniature horses round and round. It was so cute, they all looked so excited. We took a ride on the ferris wheel, and tried to land the ping pong ball in the fish bowl. not that I wanted a goldfish but it's fun just to give it a try, obviously I'm not to good at it...lol!! We stopped by a BBQ stand and got two pit turkey sandwiches, pilled high with raw onions, and BBQ sauce. Needless to say they were very good, and believe it or not they had big ole cups of sweet tea for $1. I couldn't believe it, nothing is a dollar now-a-days, and to top it off it was so so good. Now I don't know if it was the 95 degree weather that made it so good, but I didn't care because it was so refreshing. We sat down at the picnic to do a bit of people watching while we ate, this is always a great spectator sport...lol! Especially when your in a town like Dundalk MD. There are all kinds of people, of all ages, and walks of life, that travel from all over Baltimore City and the surrounding counties to attend the fair. plus with the cost of admittance only being $8, and you getting to see a great concert you just can't beat it. And you know a concert brings in all kinds of interesting people, especially a free one...lol! The Kix concert was fantastic. Steve Whiteman always puts on a great show. After eating we walked back to and sat down in our chairs with snowballs in hand, and cotton candy to the side, and got our groove on. As always Whiteman danced around like a crazy fool, yelling with that high-pitched voice of his. I was also happy because as the sun started to fall, the temperature did as well, and once it was dark it dropped to 80 degrees, which is much much better than 95. I got smart when I picked out my outfit, I wore a simple all black VSX spots bra, with a cute stars and stripes tank that I got on our trip to the Ohio Rock & Roll Hall of Fame. I figured it was perfect for the holiday theme. It's super thin and soft, so it kept me cool. I paired it with my American Eagle, dark denim shorts, and my white Converse. I love how the red and blue pinstripes on my cons match my tank to perfection. I then accessorized with my new Tory Burch sunglasses, and my brown leather saddle bag. Earlier that day I got a mani/pedi, and as usual I went with pink. The only difference is my ring finger nail has a glitter layer. I added a cute red bow to my hair, with my blush pink on pink Apple Watch. All in all it was a cute outfit, and I was comfy. I did forget to put on my sunblock though, and I paid dearly for it later. We also forgot to the bug off spray from the car, and oh boy did those mosquitos tear us up. I had to walk to the car to get the bug spray, I just couldn't take it! I'm just so glad that we had it. Next time I won't forget them, I can tell yah that much...lol! After the concert we headed home, it was about 10pm. The 2nd night we didn't go, but we went back on the 3rd night to see a band called 38 Special, another oldie but goodie!! That was a great concert too, there were so many people packed in the crowd for that one as well. Then last night for the 4th, we went to the firework show at Catonsville High School. They've been doing a show there since I was a little kid. On the way there we stopped by Rita's Ice for a yummy 4th of July treat, it's a special gelato that they have. It's red, white, and blue, with three layers of custard...oh my was it good!! I already can't wait for it to come around again next year. You can get it with any red flavor, and any blue flavor. I got Strawberry Kiwi with blue Raspberry. I love the extra custard, it's my favorite part of the whole thing. We made it to the fireworks show about a half hour early, so we could walk from where we parked. An best believe I didn't forget that bug off spray, especially since were we were watching the show from was right by a wooded area. We took our chairs and made a comfy spot to watch the show, and what a great show it was, with some length too, and WOW was the finale awesome. We were so glad that we went to Catonsville instead of the Inner Harbor, because downtown there's a huge crime element, and it's not so safe. Plus you're rubbing shoulders with so many people all packed in like a can of sardines. At Catonsville everyone was calm, with a lot of families, it was so much of a better experience. If you plan to see the fireworks next year, definitely make Catonsville High School's Show an option ...I'm so glad we did. I was able to enjoy the show without worrying if my bag or phone was gonna get snatched. I took a clip of the fireworks to share with you guys, and I also posted some in my stories on Instagram. I really hope you all enjoyed hearing about my holiday weekend, how was yours? I'm eager to hear all about them. Maybe you have some good ideas for next year already?? Enjoy the rest of your week everyone!! Thanks so much, I'm so glad we both had great holiday weekend!! Thanks so much, same to you hun! Love your OOTD and your dog is super cute! Sounds the most fun ever!! Looks like you had a great time ! So many goodies ! Wow what a fun packed weekend! Happy to hear you had a wonderful Fourth of July weekend! This looks like such a super fun time! It was definitely a great holiday!! Have a wonderful weekend!! Sounds like you had so much fun Dana. I need to come hang out with you next time I'm in Maryland. You're welcome anytime girlfriend!! Definitely hit me up if you ever come to MD!! Thanks so much, it was such a great weekend!! Ahhhh they're soon good! $1 can you believe it?? lol!! Looks like it was a fun jam packed weekend! great post love, looks like you had a great 4th! It was the best!! Hope yours was just as Fab!! You look like you had a blast!! Sounds like such a fun way to spend the 4th of July!! Amen to that ....definitely can't wait for next year already!! What a fun filled day!!! Love the pics! It definitely is, it was a lot of fun!! Thanks so much, it was definitely a good one!! Absolutely love the palm tree cup! So cute! I'm going to a carnival tonight and this made me extra excited to! It looks like you had a fun time. I can't wait for the 4th of July. Less than a month away!